Here is a snippet for my readers who are at ETS and SBL this week. 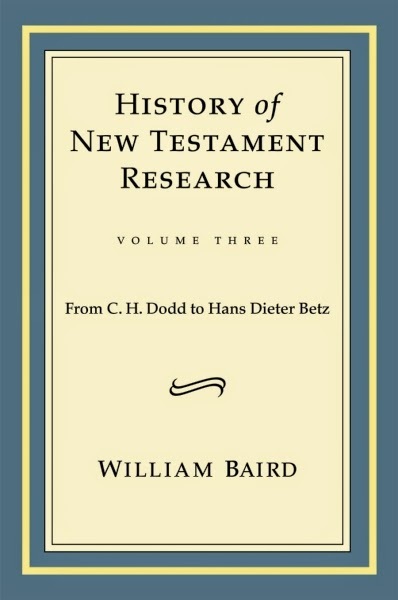 This comes from William Baird’s delightful third volume on the history of New Testament research and concerns the esteemed C. H. Dodd. “Like Zacchaeus, Dodd was self-conscious about his small stature. W. D. Davies (in a recording made in 1986) told me that when, as a student, he would visit in Dodd’s study, the furniture would be so arranged that he would sit in a low chair and Dodd would sit above him on a higher one. Dodd was notorious for his absentmindedness, once appearing for a lecture wearing one of his own shoes and one of his daughter’s. He lectured with vitality and eloquence and was famous for his sense of humor, which even crept into his publications. In the introduction to his Romans commentary he gives the reason for a ‘clumsy made cut’ at 16:23 as the ‘illimitable stupidity of editors’” (William Baird, History of New Testament Research: Volume 3: From C. H. Dodd to Hans Dieter Betz [Minneapolis: Fortress, 2013], 35).